Six decades into life, fishing trips such as the one we experienced on June 14 still fill my spirit with excitement and joy. I was fishing with Dennis Crisbo and his grandchildren, Brison, 11, Sophia, 14 and Emily, 17 aboard our boat “Goin Raptor,” a 35’ Contender. The grandchildren had never experienced ocean fishing before. After catching bait, we took the boat off the Juno Pier in 100 feet of water. Within minutes, Sophia and Emily fought and landed big bonitos, which wore the girls out. We decided to ease Brison into catching small reef fish off the Jupiter Inlet. Brison easily hauled in reef fish, including a blue runner, which I threw the livewell. From the reef, I saw a weed line about a quarter-mile away. We made the short run, and I positioned the boat over 176 feet of water on the west side of a 50-foot-wide weed line, which stretched for miles north and south. I decided to bump troll the blue runner on a Biscayne Custom Rod outfitted with a Daiwa Saltiga LD60 and 20-pound test. The runner was put down about 60 feet with a 6-ounce sinker. I then rigged a sardine on an Okuma spinning outfit also spooled with 20-pound test. I was hoping for a wahoo on the deep rod or a dolphin on the spin. About 15 minutes into the bump troll, Dennis and the kids screamed. I turned to see a deep rod bend and an explosive aerial show being performed by a blue marlin. Grabbing the rod, I realized I was the only one who could drive the boat. I handed the rod to Dennis. For the next few minutes, we witnessed a spectacle that few experience first-hand. The marlin peeled line off the reel in its high-speed, airborn show. And then, with another leap and a tail whip, it shredded the 50-pound leader. The marlin escaped, and we were left with the thrill of the fight. With two more sardines out on spinning rods, we continued our bump troll down the weed line. We didn’t make it 200 yards before both spinning rods bent. Dennis and Emily both had fish on for a few minutes. Dennis’ fish broke off. Emily battled hers to the starboard side of the boat and we saw it was about a 10-pound bonito. The bonito ran directly under the boat and we all saw a 500-pound-class marlin no more than 6 feet off the starboard. 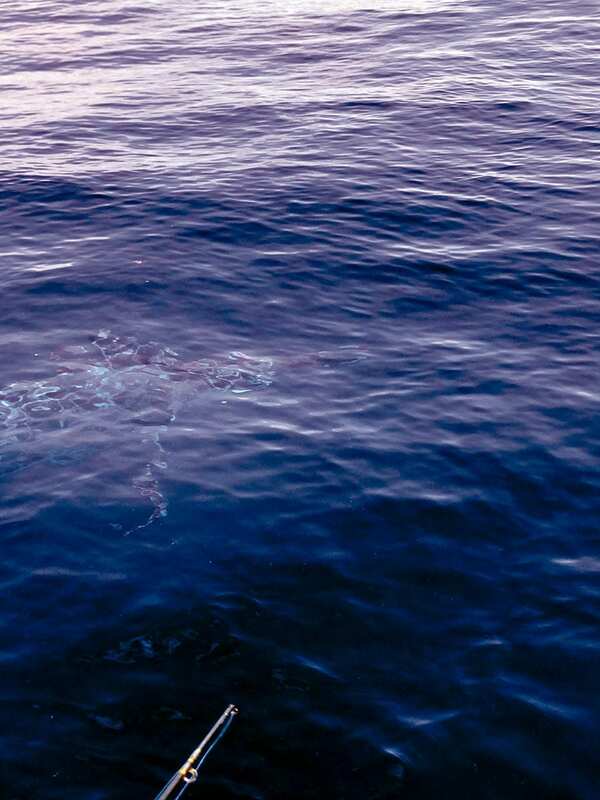 Its head and second dorsal fin lit up in a beautiful dark blue as it began to circle the boat. On the second circle, both the first and second dorsal fin lit up, and the great fish’s pectoral fins were out on the planes. The marlin circled four more times. I can only presume it was looking for that bonito, which Emily landed after the marlin swam away. It was a day that five people will always remember. I snapped photos with my I-phone, but because of the glare only one showed even the outline of the fish. The glare, however, will never remove the picture from our memories.